What does a furniture upholsterer from Detroit, a studio musician and painter from London, and a seventeen-year-old Dublin schoolboy have in common? From the director of the Oscar winning film, An Inconvenient Truth, Davis Guggenheim takes viewers on a musical journey with three generations of rockers in It Might Get Loud. 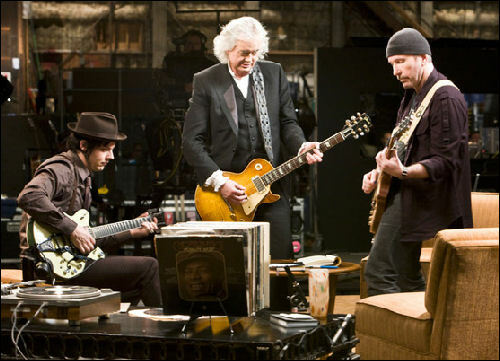 This rockumentary chronicles the evolution of the electric guitar through the likes of Jimmy Page (Led Zeppelin), The Edge (U2) and Jack White (The White Stripes), who come together to share their stories and experiences. The cameras follow the men to their origins and influential locations that shaped their music as audiences hear legendary sounds and new music from each artist. It was impressive to watch three very different generations interact with each other. Learning about their history while their music is played during the film, just shows how deeply influential their sound is today. 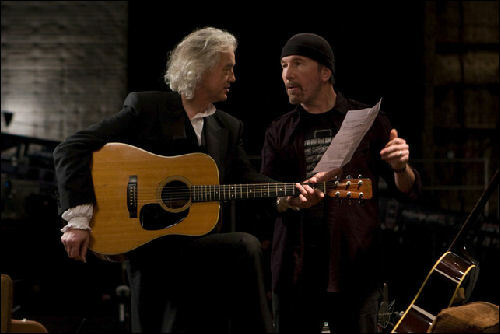 It Might Get Loud is a Sony Pictures Classics release and opens in New York and Los Angeles on August 14, 2009.